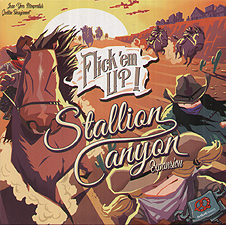 Horses are galloping into the Wild West of Flick 'em Up! Will you be able to catch and tame them, or will you just steal them from your opponents? This expansion offers plenty of action and excitement with 3 practice fields and 5 new scenarios. Flick 'em Up! base game is required to play.